As the Buffalo Sabres trudge toward the finish line for one of the most embarrassing seasons in franchise history, fans have shifted their attention toward the future. 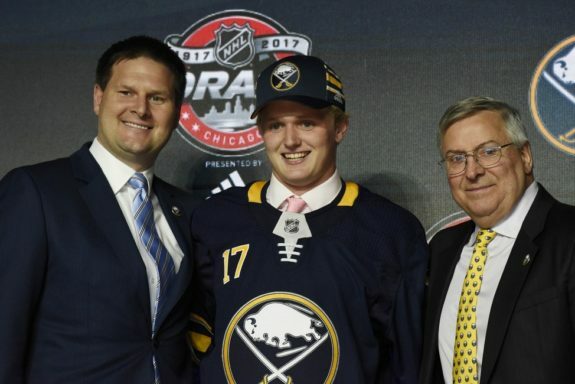 With the team struggling to produce offensively, supporters of the blue-and-gold have watched closely as top-prospect, Casey Mittelstadt has dazzled in both collegiate and international competition. 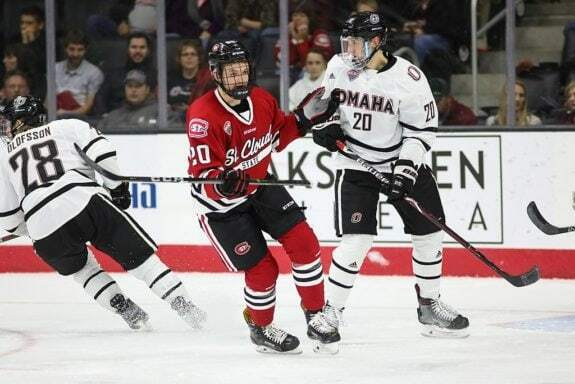 Since Buffalo selected him eighth overall last summer, there was uncertainty regarding how much time he would spend with the University of Minnesota before signing an entry-level contract. That question was answered today as Mittelstadt agreed to his three-year, entry-level contract with the Sabres. After endless debate and speculation, everyone in Western New York can breathe a sigh of relief. Perhaps now the team finally has someone, other than Sam Reinhart, who can actually compliment Jack Eichel’s skill level on the top-line. Everyone remembers the general fan reaction when the team picked Mittelstadt last summer. A majority of them were appalled that the franchise would select a player who struggled to perform a single pull-up at the NHL Combine. Soon, the all too famous picture of said struggle went viral, as fans lamented the seemingly dubious decision. Boy, were they ever wrong. It didn’t take long for them to realize that the Sabres landed a superstar. 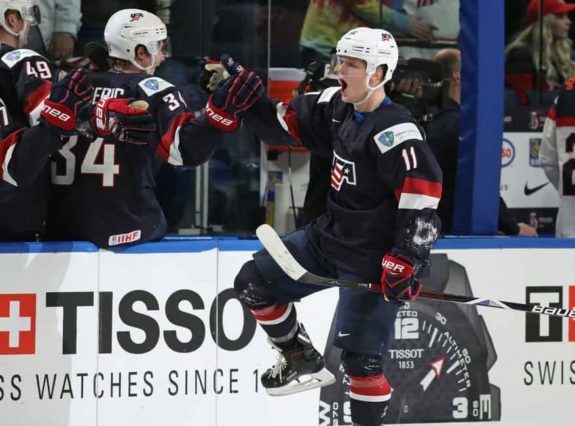 Mittelstadt took the world by storm at the World Junior Championship in Buffalo, earning himself Most Valuable Player honors, posting 11 points in seven games. His elite puck-carrying and play-making ability was on full display as he simply dominated his peers. From there, the accolades continued to pour in as his impressive freshman season at Minnesota continued. Weeks ago, he was named to the Big-10 conference all-freshman team for his near point-per-game campaign. Sadly for the Gophers, the team fell just short of qualifying for the NCAA tournament, but their loss has resulted in the Sabres’ gain. Despite his outstanding season, the Eden Prairie native knows that there is still work to be done. Fans are exhausted, and rightfully so. With the arena seemingly half-empty on most nights, they’ve simply lost interest. There is little doubt that KeyBank Center will be full for the first time in months if Mittelstadt is truly set to make his debut this week. It’s truly incredible just how quickly this young man has altered the opinion of Sabres’ fans everywhere. In retrospect, it’s a miracle he dropped as far down the draft board as he did. Without him in the fold, fans might not have any hope left to cling to. Mittelstadt’s situation is relatively tricky in terms of what his options are for the remainder of the season. As it stands, if he were to dress with the Sabres for even one game this season, a year would be automatically burned off of his ELC. Having what is considered a “late birthday,” Mittelstadt is already viewed as a 20-year-old in the eyes of the NHL. One option that the team could pursue to avoid wasting a year on his rookie deal is to sign him to an amateur tryout. This would send him directly to Rochester to help bolster the Amerks’ lineup as they prepare for the Calder Cup Playoffs. While this would seem like the most logical option given the fact that the Sabres currently sit in last place in the NHL, according to TSN’s Bob McKenzie, the 19-year-old is expected to join the big club immediately, and could dress as early as Thursday night for their tilt with the Detroit Red Wings at KeyBank Center. Mittelstadt is expected to sign his contract tomorrow and join Sabres’ NHL roster immediately after that. Could play for BUF as early as Thursday and finish balance of regular season with Sabres. May also be a consideration for Team USA at the World Championship. As of right now, it remains unclear why the Sabres front office would pursue this option, though it is possible that Mittelstadt forced their hand. Since he technically doesn’t have to sign his ELC, there was no reason for him to do so unless the team agreed to give him NHL minutes right away. It is also possible they would like to see how he performs at the NHL level before making a determination as to whether or not he needs to spend some time in the AHL next season. If this were the case however, it might make just as much sense to see how he fares in the Calder Cup Playoffs. Regardless, if McKenzie’s report is correct, the point is moot. Mittelstadt is a Buffalo Sabre, and fans should be excited. Mittelstadt isn’t the only Sabres draftee who signed his ELC this week after spending the season in the NCAA. Yesterday, the team agreed to terms with defenseman Will Borgen who has spent the last three years with St. Cloud University after Buffalo made him the 92nd overall selection in the 2015 entry draft. Unlike Mittelstadt, it has been confirmed that Borgen will report to Rochester on an amateur tryout as he helps bolster a blue line that is still without Brendan Guhle and Casey Nelson, both of whom are still on recall in Buffalo. After being selected to the 2018 Team USA men’s hockey squad this year, fans began to wonder whether or not Borgen would elect to sign his entry-level deal with the team. With the sting of the Cal Peterson situation still fresh in their minds, a very vocal section of the fanbase has expressed their objection toward drafting collegiate players all together. While the rule on collegiate athletes is certainly flawed, it really only applies in situations where players exceed their draft status once they complete their senior season. A majority of the time, if a drafted player hasn’t signed his ELC prior to their senior season, then the team either hasn’t made the proper push to get them in the professional fold, or it was deemed that they weren’t worthy of a deal to that point. Those selected in the first few rounds rarely ever reach their senior season before signing professional contracts. It’s what made the objection to the team selecting Mittelstadt all the more laughable. There was never a conceivable circumstance where he would have spent all four years in the NCAA. Of course, there is still some risk associated with drafting late-round players from the college ranks, so for that reason alone, the league needs to reform the system currently in place.